Standard - €17.99 Only 1 left! If you want to celebrate Dia De Los Muertos in style than you've got to embrace a flowery look. After all, the Day of the Dead isn't like Halloween, all spook, and no spirit. The Day of the Dead sugar skull look is all the rage for a very good reason, it integrates the beauty of life with the mysterious nature of death. The images that come from the celebrations of this festival include gorgeous mounds of flowers, rich foods, and music that goes well into the night. This enigmatic feel is a hit with parties that range from Halloween to Mardi Gras and will pair well with both costumes, casual clothing, and gowns alike. This mask is intricate with scrolling flowers and scrolling details. The nose and eyes are black as it would be on perfectly done sugar skull makeup. 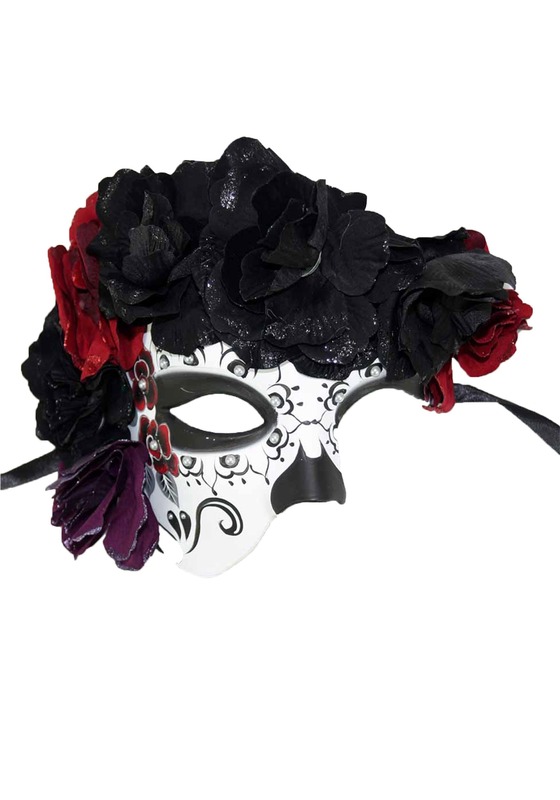 The white and black mask is topped with red and purple flowers and faux pearls. It ties on with pretty black ribbons, giving anyone who's wearing it a classic look! Whether you're seeking a spooky look or you want an elegant entrance, you'll look amazing when you top off your ensemble with this mask. No need to spend hours painting your face when you have such a showstopping mask. So embrace your dark and beautiful side put your best face forward at your next costumed event!